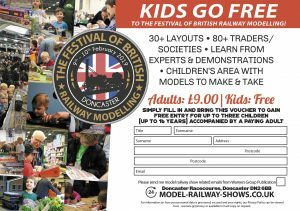 On 9-10 February, The Festival of British Railway Modelling will celebrate its 23rd year with modelling enthusiasts from around the UK at Doncaster Racecourse. This is a great day out for all the family, both you and the children will find something among the many diverse types of modelling on display to admire. Children’s step stools are available so they can watch over 30 train sets working and ask any questions. The operators are always friendly and like talking to enthusiasts. Don’t miss the colouring competition & Layout quiz with a chance to win prizes from Hornby.